Jason Fry’s latest novel, Servants of the Empire I: Edge of the Galaxy, tells the story of a promising young student destined for the Imperial Academy and his disillusionment with the Imperial system that has brought him and his family such success. It is a prequel story to the Rebels episode “Breaking Ranks,” though it can be enjoyed by those who have not seen even a single episode of the show. What makes the story interesting is that the main character, Zare Leonis, makes for a fairly good proxy for a middle-class or even an upper-middle class audience. He is basically a scholarship student, a star athlete who has a galaxy of opportunities open to him if he just works hard enough: and yet he ends up glimpsing the sinister shadow behind the glorious Imperial façade. He is not a Jedi, alien, or orphan: his family does pretty well for itself, but the Empire is still a danger to him and those he loves. It’s that angle and how it’s developed that makes this story worth reading for any Star Wars fan, even one with little interest in the show it ties into. Let’s address a couple potential concerns before we dive into the review: first, it’s a tie-in novel for a kid’s show that’s listed as suitable for grades 3 to 7. We’ve already discussed how this makes good reading independent of the show, but it also makes good reading for an older audience because of the mature and deft way that the themes are handled. The only difference between this novel and an adult novel is the complexity of the sentence structure (expect fewer subordinate clauses) and word choice. The ideas and themes are not simplified. This means that young readers might learn a thing or two from this Star Wars story, but that older readers can get drawn in and may entirely forget who the intended audience is. Stories about youngsters learning to question authority are common, but this story handles the causes and consequences of such questioning with uncommon skill. It treats the subject with the weight it deserves, instead of trivializing. The second concern is continuity: it reads just like any other Star Wars story, with a familiar setting and with familiar word-building. We had originally considered discussing this in our review, but coming up with a list of things that are still canon makes it seem as if that was the main purpose of the new novels, as reference material. As with A New Dawn, Edge of the Galaxy is a story that stands on its own that also happens to be good with continuity. It would seem almost silly to point to our previous article: What Star Wars Can Learn from The Jupiter Pirates, because Jason Fry is the author of that novel (The Hunt for the Hydra, first in a series, just as EotG is). However, the strengths of that novel are also the strengths of this one. It’s a youth-oriented novel that both appeals to adults while providing a valuable message for its younger audience. In this case, the novel accomplishes this through an identifiable character with realistic problems that nonetheless feels authentically Star Wars. The issues confronted in this novel never seem like thin pastiches of real life, though they resonate clearly with real life all the same. 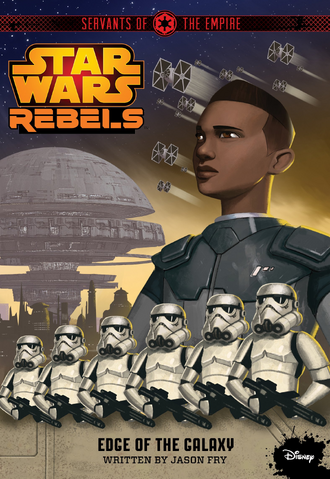 The main character – Zare Leonis – manages to be an relatable viewpoint character despite coming from a relatively privileged background. His parents are agricultural scientists, and fairly successful ones at that. The novel opens with the characters rubbing elbows with the top officials on Lothal, so they’re clearly not your average family. But his parents still had to use their talents to get where they are, and their children still have to use their talents to succeed. They’re successful, but still middle-class – especially compared to the rich industrialists or aristocrats that are usually involved in Star Wars stories. Leonis himself is trying to get into the Imperial Academy on what is effectively a sports scholarship, though he does attend a science-oriented school. Through the course of the novel, Leonis has to deal with issues that seem eminently normal despite being in a GFFA setting. He has to deal with moving to a new school, making new friends, and learning how to deal with the administration there. He’s a younger child, so he has to work through envy of his more successful elder sibling. Considerable time is spent on these issues which loom large for characters of this age – including Leonis’s participation in a sport that Jason Fry relished inventing just for this book. Leonis isn’t like the cast of Rebels – he’s not a Jedi, he’s not an orphan, a warrior, or a resistance leader. He’s got a life, and a pretty good one too. One might be forgiven for assuming he has no reason to resist the Empire, and that his family has done nothing but benefit under Imperial rule. This is an important point to get across — not everybody suffers under the Empire and many have a vested interest in its survival. Leonis certainly might — but that’s what makes his decision to turn away from the Empire more meaningful. One of our pet peeves about storylines involving rebelling against authority is that the reasons for that rebellion are often contrived and silly. Sadly, this is not a problem restricted to children’s media but it’s one that is commonplace enough there to be excusable. The concepts of revolution and rebellion are often simplified for younger audiences, allowing for more complex takes further in a person’s development. But while this is true of history education, it is seldom true in mass media. Thankfully, the causes and motivations for Leonis’s disillusionment with the Empire are not oversimplified in Edge of the Galaxy. We won’t give anything away, but suffice it to say that Leonis has to confront some very real problems. These problems first manifest themselves as inconsistencies with both his impression of the Empire and the Empire’s portrayal of itself. Injustices mount that contradict the notion of the Empire as a government of laws which allows the hard-working and law-abiding citizen to work for the benefit of the wider community. It’s not a one-sided viewpoint though: Leonis and his family really have prospered under the Empire, and Leonis’s father points out that the galaxy may not be perfect but the Empire prevents far worse calamities from befalling the galaxy. The elder Leonis has lived through the Clone Wars, and he represents a viewpoint that’s all too willing to turn a blind eye towards the excesses of the Empire as exceptions to the rule. To the father, injustices are the products of bad apples. He speaks unfavorably of a character as a Rimward, provincial bully – not like the more civilized citizens of the Core who would not abide such untoward behavior. Whether he’s right or not is not relevant — and ETE will discuss this particular example in an upcoming interview with Jason Fry – except as an example of a way that people dismiss problems in the world around them. Leonis could accept that his father knows better, and there’s some indication that perhaps his father is right, but he wants to make sure for himself. So he looks into the Imperial situation on Lothal and discovers that his father might not be right after all. There is ample attention given to exploring the Empire’s activities on Lothal and whether they’re benign and not easy to see from the perspective of a displaced resident of Lothal – sacrifices for the greater good of the galactic community. This defense is genuinely considered, and eventually rejected. Whether it’s the case of bad apples or the case of the Empire being rotten to the core (the core of the apple or the Core of the galaxy, take your pick), Leonis comes to believe that the Empire does not have Lothal’s best interests in mind. Defiance has its costs though — Leonis learns early on what happens when the Empire’s public version of affairs is questioned. He learns the costs of resistance to authority figures in general, but he has a sense of justice and camaraderie gained through his experiences building a team. The sports play a key role in the story, but they’re not the only thing going on — and they serve well as a metaphor for the state of the galaxy in general, and an incubator for the main character’s political awakening. Macro-scale political issues aren’t the only ones Leonis confronts. He also confronts issues that are more immediate for a student: success in athletics, envy of an elder sibling versus forging his own place, friendship and romance, and even discrimination. Like the political issues, they’re solidly anchored in a GFFA framework but have that quality so important in fiction of being essentially human in nature: relatable and applicable. He also has to learn how to confront these issues: sometimes going after something head-on isn’t the smartest approach, and sometimes it is. Edge of the Galaxy has a great story with something to offer to both a youth audience who might identify with Leonis’s everyday teenage travails and his political awakening as well as an adult audience looking for a more nuanced take on the Empire and rebellion. At the end of the day, we didn’t even remember that it was a novel for young readers — it just felt like a good Star Wars book. It’s authentically Star Wars, but also a good book in general. It’s labeled as a tie-in to Rebels, but it can be enjoyed independently for the way it addresses the Empire and the Rebellion. Moreover, it provides additional context and perspective for the heroes of the TV series (we could’ve written a separate article full of comparisons and contrasts) such that the TV people really ought to be plugging the book in their commercials.